Although not quite wildlife photography, my last month or so has been an emotional roller-coaster with my first sheep lambing season. Back in 2013 we we luck enough to buy some land and since then reared some bottle fed lambs. In the autumn thses lambs were old enough to meet their first rams. We've two 'types' of sheep, the first our pedigree Jacob sheep and then the ''other white'' more commercial sheep. We bought a pedigree ram at the autumn rare breed sale at Bridgwater and he's done very well, infact too well - he managed to jump in with mums ewes and serve several - which have now produced some funny coloured (black and white) lambs, one black lambe with 4 white ''socks'', white tail and white patch on her head! Lambing started badly, my first ewe having problems and giving birth, with the assistance of the vet, to 3 dead lambs. The second ewe also had problems and died, with her lambs. At this point I thought ''what is going on??'' however things improved and we've had a succesful couple of weeks - even if it's meant getting up at 5am and checking whats going on, who needs help, who's lambed, who's just about to etc and then finishing up some nights past mid-night. Through all this I've learnt how to deliver lambs, some quite easily, some not so! Our last two which have just lambed produced triplets (3) each, which again was very exciting, but has meant some additional bottle feeding to help supplement their milk. Now most are out in the field and it's great fun to see them skipping and chasing each other, playing games and just enjoying life! One yesterday morning, wondered off with a group of other lambs to ''play'' only for her mother to have not noticed which black and white lamb it was and stood shouting endlessly ... until I managed to catch it and take it back to her .... sheep!!!!! With October now with us, writing this on 17th October, I've been out following the red deer rut once again. I never really stop following the deer, always on the look out for the reds and smaller roe throughout the year. 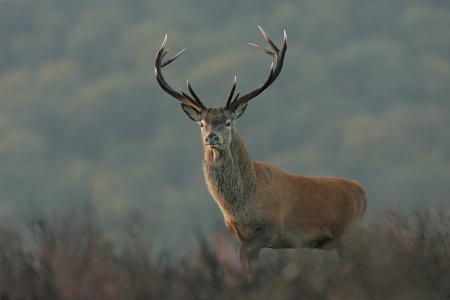 It seems that for many, the rut is the climax to the red deer calendar. The number of people I've seen on Exmoor and the Quantocks in the last week all looking to photograph or just watch the deer has been increadible - possibly too many! Lets remember that it's the most important time for the stags to ''do their job'' and continual disturbance by over eager photographers can not only spoil it for others but also hinder the progress of the deer rut. I consider a ''stalk'' - with my camera - successful if I manage to get some good images and then slip away, or the deer pass by, undisturbed. That's not to say I get it wrong, but I know I wont get any images if the deer I'm trying to approach run away! There's then the time to find another group to stalk. Taking the time and not rushing first time often produces restults - however there's the small matter of the ever watchful old hind. There always seems to be one that pops it's head up from somewhere and issues her warning 'bark'. This rut I've managed to re-aquaint myself with a stag I've watched for many years. But as he gets older he's getting harder to locate and watch. ''One-horn'' is a stag I first saw some 6 years ago as a small brow-tray-upright. On one of my scouting walks in about june my dog disturbed a stag with one normal antler and the other swinging doiwn beside his head - at this time the stags were in velvet, growing their new antlers. From then on I've watched, presumably, this stag grow to a rights-and-upright, brow-tray-two, rights and three, two heads of rights and four and now this year rights and three. Each year growing just the one antler - all but two I've managed to find each spring - more by chance than anything else! My good friend Des Sealy found his rights and 3 antler and he gave it to me to keep his run together, one is possibly still out there! Two ruts ago, October 2013, was the last time I actually saw him and I was told he was dead later that winter. There were sightings again last rut, but I didn't see him but turned up his antler this April - only then I recognised his unmistakable antler - that he was still alive! He's manged to give the Quantock Staghounds the slip twice and is now gaining some ''social status'' and a lot of people obviously recognise him. The other day a friend told me about a big one antlered stag. Next morning I headed out in search of him - was it my old stag that keeps testing me? I could hear a couple of stags roaring and one where I was told he had been seen. As I approached the field in the dark I heard him quite close but he was off chasing the hinds, without me being able to see him. I hiked up a nearby bridleway, with the stag in earshot working his way back towards the hills. At a break in the hedge I caught a glimpse - there he was ''One Horn''. I grabed a few sconds of video but the light hadn't gained enough to start photographing. I pushed on to try and get ahead and managed to get a spot behind a tree. The hinds were heading up in my direction and he was constantly running around them all, with one coming into season - he twice tried to mount a hind but seemed too exhausted to complete the job! The light continued to improve and over the next hour I had some really pleasing images and film until they moved off futher into the woodland and I decided to look for another stag. With a big grin I headed on and was soon to hear another stag groaning away and my next target! Autumn is my favourite time of year for photography as well as just being out and about. Watching the season change from the summer 'greens' to the autumn golds and through to the bare winter skeletons and long dark nights. This autumn has been dominated by mild weather - the red deer rut seems to be influenced by the temperatures. Frosts are great to get the stags going and the chilly air keeps them rutting all day, with warm and mild weather they get too hot and sweaty so only run around when they need to. This also means that the big stags need competition, whether from other big stags or young stags hoping to steel away a hind or two in hope that they may be in season and ready to mate. Natural food - acorns, chestnuts and beech mast also play a factor - if it's a good seed year then the deer move to the woods. This year was very poor for acorns, I only found one as I walked the woods. This meant the hinds were looking for food somewhere else - grass or other crops. One hind I watched, filmed and photographed in the oak woods looked hungry and was reaching right up high into a tree to pull down ivy, another favouite. October and November have also been dominated by the weather - low pressure systems rattling in from the Atlantic. Every couple of days has brought another - it has felt like January and February all over again. With my countryside contracting work it's strated to influence our work - access to fields has become difficult and rivers flowing well. No doubt the wildlife has a way of coping - some of our summer birds, such as the Swallows, set flight back to warmer sunnier lands while geese and the enchanting Woodcock come across from Scandinavia for our 'warmer' winter. The Woodcock is a small fantastically camoflaged bird with a long beak, perfect for probing the ground for worms. I never managed to photograph a Woodcock as they hide away in dense cover during the day, usually under bracken. In the evenings they 'flight' to their feeding grounds, usually taking prefered routes or flight lines. Luckily my house is on one of these lines and at dusk I ioften stand around outside looking skyward. You need sharp eyes and when one flies over bend you kneck quickly as it whizzes past. Sometimes two come together, presumably a pair and they jink and twist together. Looking forward, I hope to make my winter visits to the Somerset coast for the sea birds and the Somerset Levels for the Starlings. The starling murmurations are well documented but less so the flocks of Dunlin and Sandlings that rise over the coast line. I hope to drop into the new Steart WWT reserve that has been developed. This is a tidal reserve which has been dubbed 'Dysney Land for ducks' ,,, well depending on your view this should be a great site for duck, geese and waders as well as birds of prey over the grassland areas. Maybe Santa will bring some drier weather! October as a wildlife photographer is often a 'month of plenty' ...... or so you would hope. However 2012 hasn't been a usual year, as most people associated with the outdoors will know. With my photography days planned ahead all I needed was the weather to be traditionally autumnal - clear, cold, frosty .... but the continued rainy season hasn't relented and my first week was wet and so mainly was the second! There were chinks in the gloom, from time to time! For me this is time to follow the annual ritual of the Red Deer rut - the mating season. This is when the stags leave their 'stag groups' and head off in search of the hinds as they come into season. The big old stags round up groups of hinds while the smaller ones trot around looking for unattached hinds. When two evenly matched stags cross paths I hope to be somewhere nearby! Setting up in an area where the deer like to rut increases your chances. If you try creeping up on the deer your chances will be difficult and success rate low. The deer have a canny ability to spot movement and even with the best camoflague clothing they will generally see you before you are close enough, especially if there are several deer. I try and work an area for several consecutive days so I get to know where they will come from at first light, to where they will spend most of the day and where they may move around during the day as they need to feed or browse. I will aslo increase my chances by 'calling' the stags, by copying their calls you may get encourage them towards you, but you need to understand the call of your target stag and the various tones you can use to 'challenge' them! You do have to be careful and not overcall, remember this is an important time for the deer and you are in their world so the utmost respect and care should be deployed. Mid way through the rut I was running late but by good luck it proved perfect timing. I usually like being out at first light to locate the deer before too many other people are about. On this morning it was mid morning so I had to make the most of it. I hiked the path up the combe then a steep climb to a good view point. Reaching the top of the woodland I could hear a stag round the hill side. I crept on using the trees to hide behind but could get to a suitable point so started filming on the video camera. As I filmed I noticed the stag change behaviour, then another stag crossed my viewfinder, a bigger stag. Suddenly they clashed an an almightly fight ensued. Over 5 minutes of film and the stags seperated, the new larger stag taking the hinds. It was only then I noticed some wire around one of his antlers, he was also injured from the fight, but only a bloody ear. After a few mintues of him right next to me recovering his breath and regaining energy he moved off. He took his hinds off through the woods and it was over an hour later I caught up with him but it proved a difficult location with the stag on the skyline.